Order Costa Rica Chocolates online, hand made chocolates and cakes. Find Sisters Bakery, Giacomin cakes and Sibu chocolates on our catalog. Local delivery of awesome sweets, chocolates cakes to destinations in Costa Rica. -Gift Box with 26 chocolates different flavors. 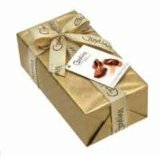 -Gift Box with 170 g de chocolates macadamia nuts. -Gift box of 200g of famous orange confiture chocolates.